This family-owned winery has a philosophy I was happy to support: "We believe in growing quality over quantity, paying attention to detail and respecting the soil." Art Direction: Karen Knecht, konnectDesign. We believe that if you give the land the respect it deserves, the land will return the favor. That means we use our best vineyard practices and natural, sustainable farming techniques at all times. For our day-to-day farming, we work with Pete Richmond and the team at Silverado Farming. Pete Richmond adopted a natural wine-growing philosophy in the early 1980s and remains a leader in research and experimentation. We designed and planted our vineyard with rootstocks and clones appropriate to the local soil and climate to minimize future problems. Extensive use of compost increases soil fertility, while the planting of cover crops replenishes soil, suppresses weeds, supports beneficial insects and conserves water. We also irrigate at night to reduce evaporation loss. To control pests and rodents, we place raptor roosts around the vineyard to encourage natural predators like owls. They work for food, not wages. GRASSI WINE COMPANY began with a dream, a passion for fine wine and an abiding respect for the land and for family. 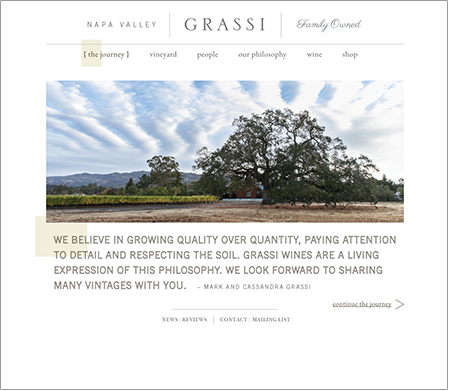 In 1999, Mark and Jami Grassi bought a 14-acre property in Napa, south of the acclaimed, fertile Stags Leap District. Mark had established a custom construction business, but the seed of another life kept beckoning. That seed had been planted decades before, when Mark studied viticulture in college before pursing a career in the construction industry. By 2000 the time was here. Mark dug the first test pits on the Grassi family's Napa Valley land and set aside four acres for planting. Early on, key guidance and wisdom came from Mary Maher, vineyard manager for Harlan, and Peter Franus of Franus Wines, who also helped oversee our first three vintages.